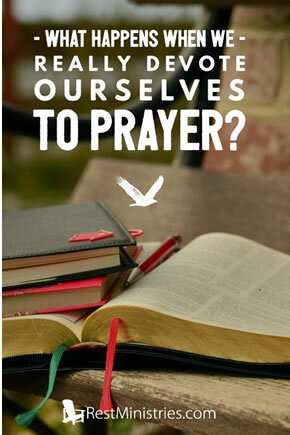 We each have a unique prayer life but when you consider what it means to devote yourself to prayer, what does that look like? Laura shares. “Devote yourself to prayer, being watchful and thankful” (Colossians 4:2). I talk to God when I wake up and thank Him for another day. I talk to Him when I say standard prayers I have known for 40-plus years. I talk to Him when I take inventory of the day just lived, thanking Him and asking for guidance. And, of course, I talk with Him while asking, sometimes pleading, for assistance. And the remarkable thing is pre-2010 I did not have this relationship with our Savior. Sure, I went to church on Sundays and prayed, mostly before meals or when crises hit. Actual conversations, however, were rare. In late 2010, early 2011, I developed a different relationship, a deeper one, with God. First, I was angry with Him for causing my illness–which I now know is a ridiculous accusation. I slowly quieted myself and calmed down and discovered the most amazing fact–God did not cause any of this, and He has supported me throughout. If I would just slow down, sit and listen I could hear Him. And this fact is comforting. A dear friend once told me of how she calls on God during stressful medical situations. She visualizes God holding her in His arms; as a father would hold his child. What an amazing idea to ponder the next time you face a medical scare. God has us all in His arms, even when we have no idea of this. We must persevere and try to live our best life; the life that God would want for us. Prayer: Dear Lord, help us to find time daily to pray to You and to listen. For we know that all things are better with You by our side. Amen.